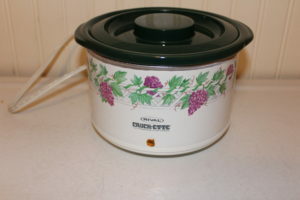 I found this Crock-ette at Salvation Army a few years back and it’s perfect for heating up soup for one. The insert is removable, but there is only one temperature setting and that is low. It’s a perfect little Crock-Pot to bring to work if you need to work during lunch hour! Crock-ette; great for soup for one!